This past year, beginning in the early spring, we had a TON of these "mystery plants" springing up around our back yard...everywhere! We had recently pulled out a lot of Horehound, which is considered a noxious and invasive weed here in our high desert mountains, and this left the ground disturbed. Wouldn't you know? Up sprang a new "weed." We let them grow about 2 feet tall, then decided we'd better pull them up in the area near the chicken coop. After asking neighbor after neighbor and my parents who know all about plants out here, nobody knew what it was! "Just a weed," they said. The ones we left to grow out of curiosity grew to between four and six feet high! That's quite a weed! Lambsquarters are actually delicious, with a taste and consistency similar to spinach. In addition, it's said they are highly nutritious....even more so than spinach! Lambs quarters patch by our fruit trees being enjoyed by the poultry. We had a second very large patch in our inner yard, too, by our fruit trees. I told my husband that I thought we should just let them grow and see what happens! So all summer long, I have been trying to figure out what they are, as I watched them grow up to 6 feet tall! The leaves have variable and irregular edges, and are very soft, with a white powdery cover on the bottom. Later in the summer tiny flowers emerged at the top of the many stems, which emerge from woody stalks. Here is a little flower cluster. They grow out from stems up and down the tall, woody stalk. The tiny seeds are similar to and can be used just like quinoa. These flowers are a little more mature. The plants are ready to go to seed. 1) You can eat them raw in salads! They are high in oxalates, though, just like spinach, so some people may be sensitive. Rinse the leaves well. You'll need a lot because they steam down to a very small amount, just like spinach. See how the water beads up on the backs of the leaves? Another sign of lambsquarters. The leaves are very soft and powdery, especially on the back, and this causes the water to just drain right off! Have you ever wanted to formulate your very own tea blends? Ready to make your own delicious & healthy teas? Learn how in my eBook! Cover and steam them down with water, salt, and pepper. These have been cooking for about 2 minutes. I ended up cooking them for about 10 minutes total, before they looked just like cooked spinach. Here's my little bowl of steamed lambsquarters. I added some olive oil and balsamic vinegar. I'm sure you could add feta cheese & some garlic too, if you like! It's truly delicious! 3) I understand you can use the seeds too. Lambsquarters, it turns out, is a relative of amaranth and quinoa. To harvest the seeds, just place a paper bag over the flower clusters, bend upside down, and shake well. The seeds fall into the bag. To eat them, just cover with water overnight to soak, then rinse. Cook up! If you want to cook them even more traditionally, add a tablespoon of whey to the soaking water. I haven't tried this yet, but as soon as the seeds are more ready, I'll be giving this a try! 4) I love dehydrating my plants and making a fine powder from them. You can sprinkle the powder into your foods for additional nutrition. If your kids don't like their beet greens or spinach, try this out! I plan to use lambsquarters to make an exceptional powder! You can find out how to make Nettle Powder in this article, and the directions would be the same for other greens as well. Having never seen lambsquarters before in my life and with nobody else knowing where to even start, it was a little tricky. 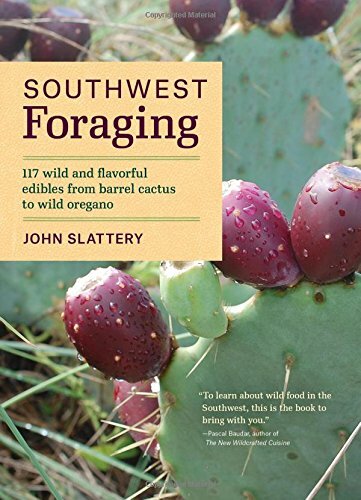 Then I ran across this book, Southwest Foraging by John Slattery. What a lucky find! Not only was I able to identify lambsquarters, but many other plants in my yard...like Sow's Thistle, which I thought was really scraggly Dandelion. Amazing. I love being able to eat right from my yard, even though I have a fine garden this year (except the tomatoes...they did very little for us this summer). NOTE: I am not a botanist or a scientist. Be sure that you know what you are eating when trying to identify wild plants to forage and use. I checked several sources besides the above book before giving our lambsquarters a try...just to be sure. If you see this plant around, take a look and consider using some for your next meal. At the very least, you will have experienced eating lambs quarters and therefore be a little more prepared in case of a disaster where there is little food to be had. I'm glad I have this new knowledge to share with you. You know what? Every little bit of preparedness will help if ever SHTF. Survival Skill: What About Female Hygiene Preparedness? What Did Ladies Do for That Time in the Olden Days? Do you forage any of your own food? I'd love to know what you've found in your backyard or if you know of other ways to use Lambsquarters! Oh! And by the way---if you are interested in learning more about using herbs for health in your own daily life and want to take a class or two or three, I love The Herbal Academy of New England. They seriously have something for everyone over there. If you live in the Southwest, this is a must-have book if you are into or thinking about possibly having to survive if something happens...or if you just have an interest in the edible plants in the area! I've been using this book constantly since I bought it! 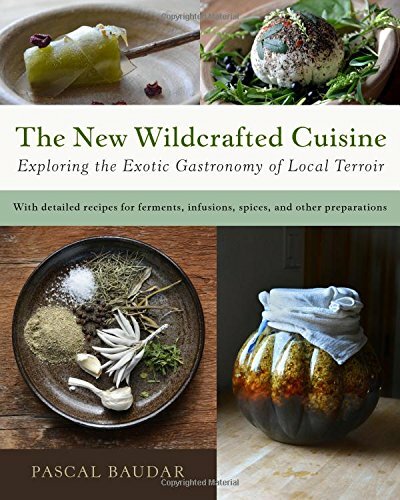 This is a really great book with many ideas for using wild harvested edible plants. Lambsquarters can be found in this book too, I was happy to see! I like using this book for all kinds of things, especially making cold infusions from foraged plants such as pine, manzanita, and Mormon tea. There is a LOT more to this book, too!